Hi, I'm Patrick McMurray, self proclaimed Oyster Geek! "You're only as good as your tools.."
The unique ergo-dynamic Dual Axis Pistol Grip design keeps the forearm in alignment with the blade for maximum transfer of power. Dual axis lever = less force to open oysters. The nontraditional, slightly longer 3" blade with tapered tip is the perfect sharpness and length for all types of oysters. Made of High Quality Stainless Steel (HRC 55-58). 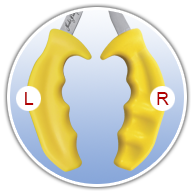 Integrated finger guard and non-slip handle offers superior protection when shucking. Light weight high-impact injection moulded non-slip PP handle provides highest in sanitary qualification. Ambidextrous – Suitable for left or right handed. Food trends may come and go, but some things in gastronomy never change. This holds true to eating with these salty, slippery gems called Oysters. Picture this: Patrick McMurray's worktable is littered with tiny, slimy, living creatures. His right hand swerves dangerously back and forth, sharp steel flashing, digging, prying and separating oyster shells in clean, uninterrupted motion. Shucking for almost 20 years and countless accolades, Patrick has perfected the art of shucking oysters, therefore developed an Oyster Knife that will let you, Professional or at home, to "Shuck with Ease". The Shucker Paddy, is the result of three years experimentation and 50 prototypes. 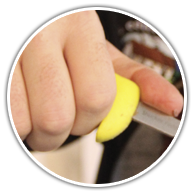 The knife's handle fits the palm like a pistol; a 3 inch notched stainless-steel blade is where the pistol's barrel would be, with sharpened edges top and bottom. Traditional oyster knives have only one axis, running straight down the blade, but the Shucker Paddy has two - one down the blade, the other down the angled pistol grip. That dual axis gives the knife a lot more leverage and less force required. 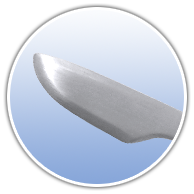 The handle on a traditional oyster knife is a teardrop or pear-shaped knob. 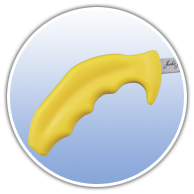 "It tapers toward the blade and doesn't provide enough contact in the palm," says Mr. McMurray. His restaurant kitchens shuck about 4,000 oysters a week. The difference is akin to turning a doorknob compared to a door handle. Holding the Shucker Paddy palm down, you firmly wriggle the point of its blade about 2 millimetres into the oyster's hinge. Then twist your wrist clockwise (counter-clockwise if you're left-handed). As the knife's tip rotates, the oyster pops open. The world is your oyster. Shuck with ease, Shuck like a pro!